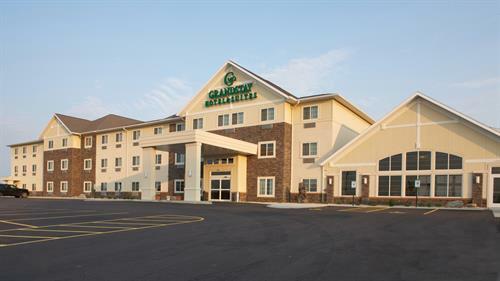 Awarded TripAdvisor's Certificate of Excellence for 2016, the GrandStay® Hotel and Suites welcome you to your new home away from home in Mount Horeb, WI. This beautiful modern hotel offers an outstanding range of amenities to ensure a pleasant stay, whether it's for a business trip, overnight stopover, or family vacation. Convenient to Madison, GrandStay® is also a great option for guests visiting neighboring Barneveld or Epic Systems in Verona. Mount Horeb, with its strong Norwegian heritage, is recognized as the "troll capital of the world,” and for its year- round activities. Area visitors can explore the colorful crystals of Cave of the Mounds, and delight in outdoor winter fun at Tyrol Basin. From Madison, head West on US18/151. Take Exit 69 toward Mount Horeb, then take the first Left onto Lillehammer Lane.